I have uploaded a very condensed photo album with less than 120 pictures of the trip to my Flickr. This set may or may not grow in the future, depending on my free time and motivation to post process more photos. Also, there's a roadtrip movie I have been working on the past couple of days coming up pretty soon. Stay tuned and enjoy the photos. super friendly and curious. "Are you speaking in German?" Following Grand Canyon, we headed West to Las Vegas. Before driving into the city, we made a short stop at Hoover Dam to see what all the fuzz is about. This dam is far from the largest or highest out there, however considering it was built in 1931-35, I couldn't help but be impressed. The dam provides both water as well as power for Las Vegas – a completely insane city. Let the pictures do the talking. I am going through all of the video and photo footage I have accumulated over the 30 days of travel. Here's a short preview of Arches National Park. Even though I am currently sitting in a transatlantic flight from Philadelphia to Munich, this blog is far from over. Due to lack of (usable) internet in our last couple of accommodations, I was not able to upload any photos or text updates. Once I am back in Vienna and have access to the www as well as a computer capable of handling all the image and video footage, I will post some more impressions of this trip, including the last couple of days spent in Las Vegas and Los Angeles. Our last week in the states is highly dominated by national park visits. Luckily, this weekend is Veteransday Weekend meaning all state-run national parks have no entrance fee. This way, we’re saving a lot of money (which we can later spend in Las Vegas). We started off with Arches National Park in Utah, known for it's naturally - through erosion - created sandstone arches. They range from thick, large arches reaching great heights all the way to thin delicate structures looking like they’ll crumble any minute. Very impressive. The road led us further south to the state border of Arizona where we visited Monument Valley, a national park owned and run by Navajo natives. The location is well-known from various western movie sets. The vastness of this land is overwhelming. Next up: Lower Antelope Canyon. This is by far the most interesting natural formation I have ever seen. The canyon is formed by flash floods and air passing through its extremely narrow cracks creating beautiful abstract shapes and forms. In fact it's so narrow as to only allow one person to pass through certain sections. It truly is a magical place. The fourth canyon on our tour is Bryce Canyon in Utah. This too was formed by tectonic movement and the shifting of various sediment layers throughout the millennia. The color play between red, white and green - along with many patches of snow - left a memorable experience on me. We took the peek-a-boo trail for roughly 3 hours in the afternoon; temperatures varied from ’fairly warm, I'll take of my sweater’ to ’better put on my gloves’. The final visit was Grand Canyon. To be honest, it's not as impressive as the other canyons except for its shear size. It really is grand and sadly also overrun by tourists; even on a Tuesday afternoon in November. After not getting in to Yellow Stone National Park, the groups moral was broken. We travelled further down south to find hot springs close to Idaho Falls. Once we arrived at the site, we found them not only closed as well but also not charming at all. We all decided that the day was officially the worst day of our journey. Later in the afternoon, we pulled up to a gas station to fill up the cars. We started talking with the cashier who told us, that there are other hot springs which are usually only visited by locals. So we took off once more in search of hot water. We climbed a mountain, following a rather warm river in hope of finding hot spring at the top. Sadly, there were no springs to be found however, once we turned around and looked down the mountain, we were rewarded with one of the most beautiful sunsets. Idaho is vast. Very vast. We bid Vancouver a farewell and left on the longest journey of this trip. In one day, we drove from British Columbia to Yellowstone National Park — 1650 km or 17,5 hours. We crossed four states including Washington, Oregon, Idaho and Montana and travelled through one time zone border. We drove through heavy rain, thick fog, some sunshine and snow storms; we were stuck in a massive traffic jam and then had passages where we were the only ones on the road. In Toppenish, WA a police patrol pulled us over for speeding. Somehow, after stopping for gas, we got on the wrong road and happened to drive way to fast. Turns out US Officers are extremely polite as the young sheriff would only give us a warning and even explained the way back to the interstate freeway. Later that night, we arrived at our destination, a little town called West Yellowstone right at the western entrance to the park. As we checked in, the night concierge told us that the national park was closed for several days due to snowfall. It will reopen in several days for ski-doos. That info really put the cherry on top. Turns out we drove all this way and couldn't get into the park. The night was spent in a nice lodge-style apartment with an artificial fireplace and several bottles of wine. Let's see what the next day brings. Seattle and Vancouver. Two amazing cities, similar in many ways and yet so different. Vancouver definitely is one of my highlights of our journey. The Canadian lifestyle and mentality is something I can relate to very well. Vancouver’s 10-step program of becoming the world’s greenest city by 2020 is ambitious and gives the right impulses. Vancouverites are open-minded, ride their bikes in every weather and love their Stanley Park as if it were their own child. I freaking love it here! Starting in Klamath Falls, we headed north west to Crater Lake National Park. I have to be honest: this has been one of the most beautiful days of the journey. Just 1,5 weeks ago, we were bathing in the Pacific in Orange County; today, we hiked through snow at 2500m altitude. After 3 hours of pulling our bodies up and down the mountain, we headed west to check out some waterfalls in the middle-of-nowhere. Another 3 hour drive and we are calling Portland our home for the next 3 days. San Francisco is long gone and feels like a lifetime ago yet it has only been 48 hours since we left the Bay Area. On Sunday morning, we packed our bags, had one last breakfast and said goodbye to an amazing AirBnB apartment. Since we have crossed the Golden Gate Bridge by tandem bike two days before, we decided to drive up to Napa through Berkley and the harbor bridge. A short stop was made directly in Berkley to check out the campus of the University of California. Just three days prior to that day, we had the chance to take a look (and actually get a tour) of Stanford. It was interesting to compare these two well-known universities. The drive from Berkley to Napa took only an hour and soon we would find ourselves in California’s famous wine region. To be honest, when thinking of Napa Valley, I imagined something completely different. The valley was barely a valley with its vast open, flat landscape – you would only occasionally find hill slopes covered by vineyards. The next shock was the whole wine tasting experience itself. Many wineries are aligned on the main road through Napa Valley, but mind you these wineries are at a scale you simply will not find in Austria (and Europe). Once gift shops not only sell wine but also T-shirts, hats and wine glasses with the family’s name printed on them, you know that a new level in marketability has been reached. Restroom facilities are dimensioned in a way to accommodate hundreds of guests per day. Another thing that surprised me were the prices. We only had the chance to visit three wineries since most of them close at 5pm, however none of them had prices of less than 20$ per bottle. The cheapest usually started at 22-25$ with an average of around 50$. Definitely not a destination for a bunch of students to stay for more than one night. To balance our individual budgets, we slept at a motel and rented a room for four people. There are eight of us. Let's just say the night was cosy. Today was spent mostly in our cars. We drove up to Klamath Falls in Oregon where we arrived at 8pm. A short stop was held in Redding to take a look at a pedestrian bridge by Santiago Calatrava. Tomorrow we’ll go for a hike at Crater Lake reaching an altitude of 2900m. Since the temperature here in Klamath Falls is 3 degrees, we expect pretty frosty conditions up in the national park. On our fourth day, we headed north along the Monterey Bay. Our destination would be Santa Cruz, a place with divine beaches and amazing waves – 'surfer's paradise' as some travel guides claim. Upon arriving in Santa Cruz, we were welcomed by 10°C, fog and ocean winds. Needless to say, our breakfast on a park bench overseeing the beach was held short. After a quick stroll on the pier, we got back into our cars and drove north to Henry Cowell National Park, home to the famous redwood trees. Obviously, these trees did not approach the height and size of their brothers in Yosemite NP nearly as much as we had hoped, the trail through the wood was an exciting change to one month of hot Orange County nevertheless. After some nature impressions it was time to hit some more technology-oriented sites. We visited Apple's mothership in Cupertino, popped by at NASA in Mountain View and biked across Google Campus in Shoreline. The day was topped off with the arrival at our amazing AirBnB apartment in San Francisco. We have the most incredible view of the city from our terrace, the rooms are generous and spacious, and the home-cooked dinner was just the best thing ever. Today, we visited Monterey Bay Aquarium – one of America's largest aquariums. Most impressive was the 'Open Ocean' tank filled with hammerhead sharks and tuna alike. I've been filming a lot in the past days and can't wait to start cutting a movie once I'm back in Austria. 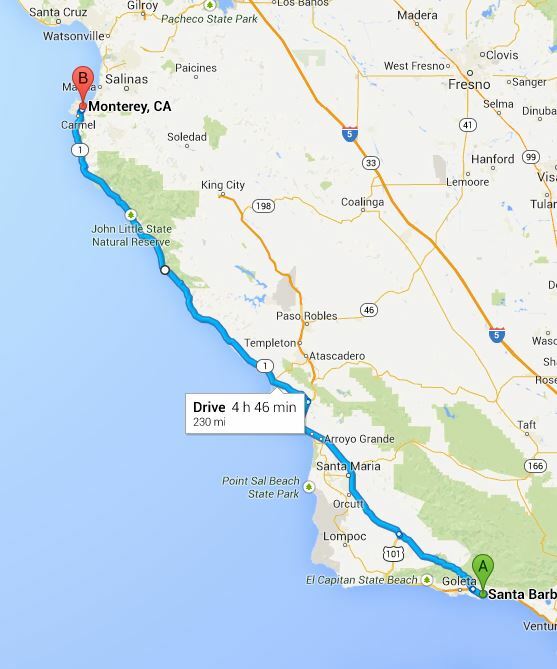 Tomorrow, we'll be heading further north around Monterey Bay into Santa Cruz. From there on, the journey is bound inland to San Jose and Palo Alto. At the end of the day, we'll hopefully be our AirBnB Apartment in San Francisco. Day one was spent in Los Angeles on Hollywood and Sunset Boulvard. In the evening, we drove west to Santa Barbara where we stayed for the night. After an awesome breakfast on the beach, we got in our vans and headed north along Highway 1. These photos are just a small collection of what I saw. 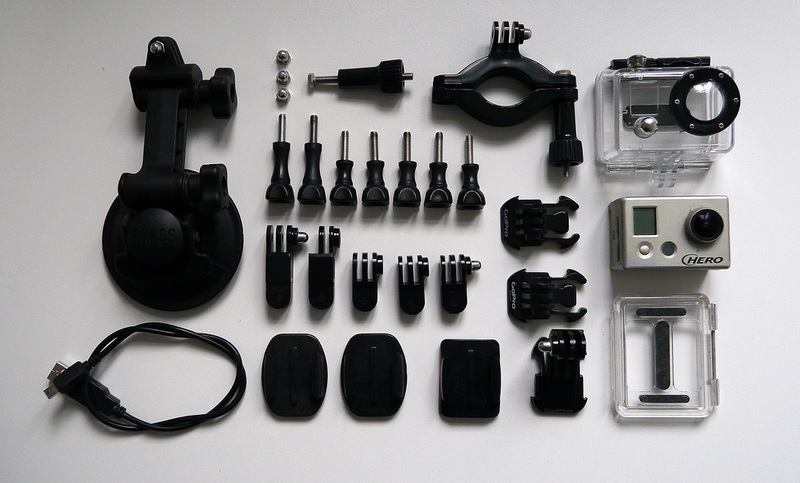 A friend of mine was kind enough to lend me his GoPro Camera. Being equiped with both my Lumix G5 as well as this Hero1, I'm definitely looking foreward to filming on the upcoming roadtrip. In preparation for my 1-month trip along the Westcoast of North America, I met up with my travel buddies last monday to decide on a possible route. We placed several destinations on a "must-see" list and then tried to work out any order that would make sense from a financial, chronological and economic point of view. Below is a rough plan of what we came up with. In case anybody has tips and suggestions, please let us know. 01 The first part of our journey will take us out of Los Angeles along the coast on Highway 1 up to Santa Barbara. With beautiful beaches and people, we will be in for a special treat. 02 After a hopefully relaxing time bathing in the Pacific, we're headed north through Santa Maria. We'll probably make a stop at Hearst Castle, a crazy funky landmark built by Julia Morgan for newspaper magnat William Randolph Hearst. Since the drive up to Monterey is approximately 5 hours, we will spend most of the afternoon cruising on Highway 1. I've done some street-view previews ahead of the trip to check for sea lions; sadly, I couldn't find any. 03 Having spent some time in the Monterey Bay area for approximately 1 day or so, our journey will take us through Santa Cruz away from the coast. Travelling further into the country, we will pass Cupertino and Palo Alto and will eventually arrive in San Francisco. From today's point, we reckon we will stay here for at least 3 whole days. I was planning on a bike or hike citytour with some locals. Perhaps Alcatraz. Cable-car. You know, the very typical San Franciscan touristy things. 04 We'll depart from San Francisco by crossing the Golden Gate Bridge heading further north into Napa Valley, famous for its vineyards. The plan is to stay in Napa Valley for at least a day of hiking and wine tasting. There even is a train that takes you around. 05 This is where we really start to coil down the kilometers. It's a 5,5h drive from Napa Valley to Klamath Falls across the state border into Oregon. In the town of Weed, we will take a right turn further into the country and national park territory. This region is bound to be good for hiking and taking in nature at its fullest. 06 Next day will be another long drive from Klamath Falls to Portland. We're thinking of stopping in Eugene for a day, not only to divide the driving time into manageable bits, but also to check out the local landscape, including a Crater Lake and some more national parking. Portland is said to be a very green (and European) city. The plan is to stay there for at least 3 days. We'll see. 07 It's only a short distance of less than 3 hours from Portland, Oregon to Seattle, Washington. This is quite good as it gives us more time to enjoy these beautiful cities. To be honest, I know way too little about either city to properly decide how long to stay in each. I'll have some catching up to do until then. 08 Depending on the car rental deal we are able to sign, we might either take the rentals all the way up to Vancouver, Canada, or leave them in Seattle and take the Amtrak from there across the border. Either way, it's only a couple of hours from Seattle to Vancouver. The only problem if we take the train to Canada will be getting around in Vancouver. Perhaps we take the chance and decide on public transport. This is still being decided. 09 The next part of our journey will be traveled by plane. Namely from British Columbia down South into Nevada. We'll arrive in Las Vegas on a Sunday evening hoping to avoid ridiculous weekend prices of hotels. One full day in Vegas should suffice; after all, it's a good place to loose some money. 10 The last and final stage of this epic Westcoast trip will take us from Las Vegas into Death Valley, further south to Palm Springs and then back to Los Angeles. 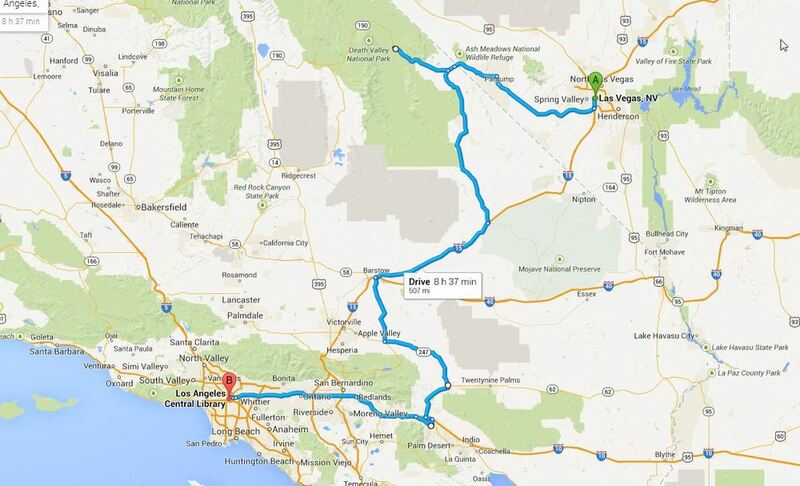 Admittedly, this stage includes some d-tours, especially Palm Springs. We'll have to see if the architectural gems located there are worth it. This will most likely be decided ad hoc. The plan is to have at least another 3-4 days in Los Angeles for Universal Studios, Shopping and the City itself. We fly back to Austria from LA on Nov 17th.